If you’re a small business owner, I’m willing to bet that a good amount of your business comes from short-term marketing promotions along with word of mouth referrals because hey… you are very good at what you do. Word of mouth marketing is an extremely effective strategy, but it comes with one very big limitation. You don’t have much control over it, and it can be difficult to measure. You could pay for leads, but last time I checked, $25 per lead was a little expensive when there is no guarantee that the lead will even convert. Most marketing strategies require a specific dollar amount to be invested with the hope that you earn a return on that investment with a ratio over 1. In other words, you just want to make more money than you spent. Local SEO (Search Engine Optimization) is something that I personally feel small businesses should be doing for one very important reason—it doesn’t necessarily require a lot of investment. The other often over-looked benefit is that SEO is a long-term play. So while it takes a little longer for the results to kick in, you’ll reap the fruits of your work for a very long time even if you aren’t actively putting any time into it down the road. If you are strapped for time and are generating a large enough amount of revenue to afford hiring a consultant, make sure you ask for references and contact those people. Ask about the candidate’s strategies and if the only thing you hear is about link building with directories, social media, and articles, I would implore you to move onto the next guy or gal. Keywords – Put yourself in the shoes of a potential customer; actually go to Google and make an exhaustive list of all of the different types of ways they might search to find someone like you. Take all of those terms and replace your city with one or two major cities that are adjacent to yours. This should double or triple your list. Take your list and run it through the Google keyword planner tool. All you need to do is sign in with a Google account, click the “Get search volume for a list of keywords or group them into ad groups” option, paste in your list, click the blue button at the bottom, and then click the download link in the upper right of the next page. Now you have a list of the most popular types of phrases your customers are searching for that you will want to help influence your messaging. Google Business Listing – If you have never seen this page, you may want to spend about 30 minutes to claim your listing and fill it out with the correct information. If you have operations in more than 1 city, I’d recommend creating a unique listing for each location. Organizations & Groups – Are you paying an annual fee or taking time out of your schedule to meet with a particular group? If so, make sure you get them to link to your website. Make Friends – Walk outside your door, look around for other small businesses and take some time to make new friends. With these partnerships, you can find innovative ways to link to each other via guest posts or offering relevant discounts. A good example might be a partnership between a crossfit gym and a chiropractor. A bad example might be a hair cutting salon and a restaurant. Local Press – If you have any events or newsworthy items like a remodeling or a charity drive, etc…contact your local city newspaper and pitch them the story. More than likely they will take it. Local Attractions – Take pictures of well-known places in your city and create an awesome page or blog post that talks about each of them. Examples might be amazing restaurants that were featured on a Food Network show, a hidden lookout point that gives you a view of the entire city, etc. Local Events – If there are local races, marathons, or other fun activities that will be hosted near your business location, talk about the best places to park and ways to avoid traffic. If you have a big parking lot, offer up your lot for those that sign up via a form on your site. Google Maps Street View – Take a look at your Google Maps street view images around your business. If the images are blurry or don’t show a good view of your building, go outside and take a nice picture to show on your Google Business listing page. Local Construction – Google Maps does not update their imagery often, so if you know of local construction going on, write about it and mention any street closures. Crime & Heroes – Are there any local crimes that you feel the public should be aware of and any local heroes that you might be able to interview? 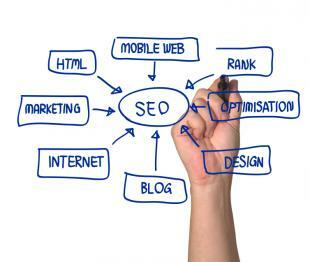 You probably noticed that most of these small business search engine optimization tips are not centered around anything manipulative. Your blog will be one of your most powerful assets, so make sure everything you do is going to benefit others around you. One final thought is to make sure you are tracking your data. If you haven’t signed up and implemented Google Analytics, make sure you go do that now because all of the SEO tips above will only be beneficial if you can measure the impact! This post is the third in our “Learn a New Skill in 2014” series. Check out our posts on finding your work/life balance and learning a new language.